After spending four days underway, Arleigh Burke-class guided missile destroyer Ralph Johnson (DDG-114) successfully completed a series of in-port and at-sea demonstrations as part of the builder’s trials. Johnson is the second Arleigh Burke-class destroyer built by Huntington Ingalls Industries in Pascagoula, Miss., since the Navy decided to restart the DDG-51 production line in 2008. The Navy also contracted General Dynamics Bath Iron Works in Maine to build Arleigh Burke-class destroyers as part of the production restart. The first of all the new Arleigh Burke-class destroyers, USS John Finn (DDG-113), was recently commissioned on July 15, 2017. The new DDG-51-class ships are being constructed as Aegis Baseline 9 Integrated Air and Missile Defense destroyers. These ships have increased computing power and radar upgrades improving detection and reaction capabilities against modern air warfare and ballistic missile defense threats. The modified version of the Aegis Combat System creates a composite picture of the battle space by enabling ships such as Ralph Johnson to link radars with other ships and aircraft. The new destroyers will be able perform traditional air warfare missions and ballistic missile defense missions simultaneously. 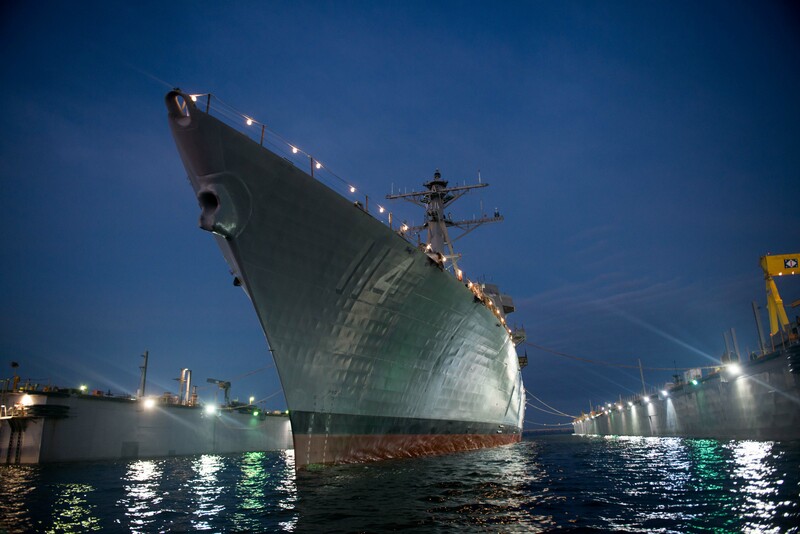 “We’re extremely proud that this is the second ship we’ve taken to sea from Huntington Ingalls since the program’s restart, and in both instances, builder’s trials performance has been very successful,” Capt. Casey Moton, DDG-51 class program manager, Program Executive Office Ships, said in a Navy statement. While underway, Johnson successfully demonstrated full power runs, self-defense detect-to-engage exercise, steering checks, boat handling, and anchoring. The next major milestone for Johnson will returning to sea for acceptance trials with the Navy’s Board of Inspection and Survey. This is when all systems and gears are inspected and evaluated to ensure their quality and operational readiness before the Navy accepts delivery of the ship. Huntington Ingalls Industries is currently building Burke guided missile destroyers Paul Ignatius (DDG-117), Delbert D. Black (DDG-119), Frank E. Petersen Jr (DDG-121), and Lenah H. Sutcliffe Higbee (DDG-123). Huntington Ingalls Industries is also under contract for an additional ship awarded as part of the five-ship multi-year procurement for fiscal years 2013-2017. Bath Iron Works is currently building Burke guided missile destroyers Thomas Hudner (DDG-116), Daniel Inouye (DDG-118) and Carl M. Levin (DDG-120). Bath Iron Works recently delivered to the Navy guided-missile destroyer Rafael Peralta (DDG-115) and is building Zumwalt-class guided missile destroyers Michael Monsoor (DDG-1001) and Lyndon B. Johnson (DDG-1002).